Two things profoundly touched me at Mass today. These things are shared not for my sake but to encourage and inspire the reader — you. 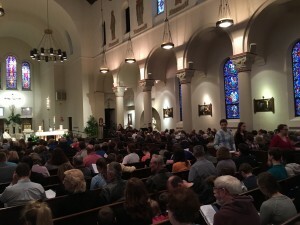 First, the Mass was full and people were standing in the back. This is a “poor parish” but Fr. Bob and a team of young people have reached out to the community. It has worked. 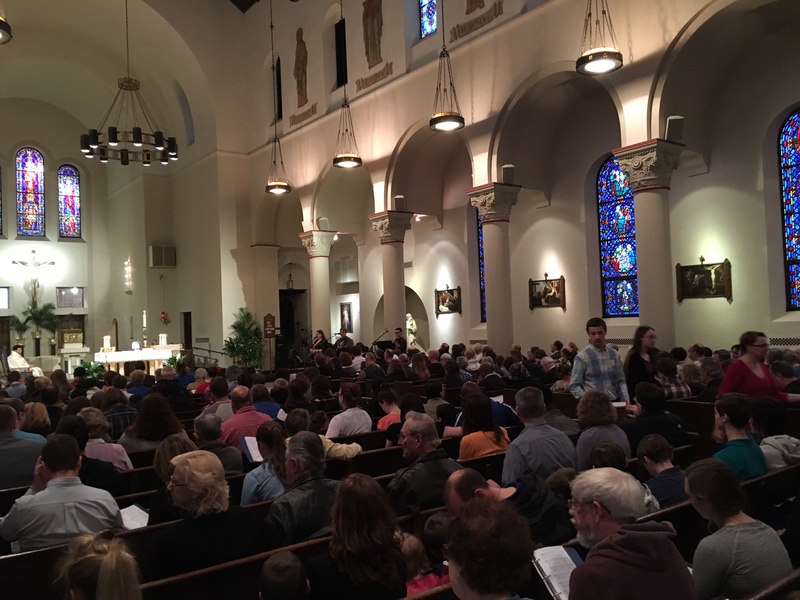 The church is full for all the weekend Masses. What is particularly moving is the blend of people — a great snapshot of the universal Church. Lots of whites, yes, but black singles and families too. Orientals, Middle-eastern, Hispanics… And I made a mental calculate yesterday and concluded that more than half of the people were under the age of thirty. And they were participating, singing praying and visibly enjoying the Mass. What a joy for me! The Church is very much alive. The second thing that touched me was a young black girl with her baby. She was nicely dressed and took good care of her baby boy. She looked uncomfortable, didn’t go up for holy communion and stayed to herself. I said, “I didn’t know. The Lord told me to give you $50 and so I did.” She thanked me again and with a still incredulous look on her face she gathered up her baby and diaper bag and I was grabbed by another couple and didn’t see where the young mother went. I have a call in to the pastor to see if I can find out who she was so we can maybe help her some more. After that event I thanked the Lord a hundred times and laid in bed full of joy that God had used me to do — who knows what? Was that her first time to church feeling lonely and not sure what to do? Did that small act of kindness pay a bill or allow her to buy food much needed that day? Will it encourage her to come back to Mass? Will that small act of generosity inspired by God lead that young boy to be a priest someday? I don’t know, but I am very happy this morning. The Lord is correct, “It is better to give than to receive” (Acts 20:35). Try it!